Stress is a usual and normal part of our daily lives. It is a normal physical reaction to an internal or external pressure that is placed on a person's system. Extended periods of stress can cause destructive changes in the body such as depression, heart disease, cancer, stroke, ulcers, back pain, headaches, raised blood pressure, indigestion, and various other problems. Because of the nature of their professions, the mental health of ICU staff is not only of concern to them but also is of concern to the larger society served by them. Hence, this study was planned with an objective to assess the prevalence of stress and its level among ICU staff working in various hospitals, as well as to correlate the level of stress with certain variables. A cross-sectional study was conducted in the ICU of various Hospitals in Pune city over a period of 1 month. Prevalence of stress among the ICU doctors revealed 29% according to a study conducted in UK. Based on this a prevalence of stress of 29% was assumed for calculation of sample size. The sample size is estimated based on 10% of absolute error at 95% confidence interval. This was estimated by the following formula: n = 4pq/l 2 where p = 29%, l = 10%; therefore, n = 4 × 29 × 71/(10) 2 = 82. Hence, a total of 82 ICU staff (doctors and nurses) in equal number were included in the study. Study population comprised all doctors and nurses working in the ICU. Inclusion criteria consisted of all ICU staff (doctors and nurses) posted in various hospitals at the time of the visit. Section B: Stress rating scale. DASS scale  (for stress only). 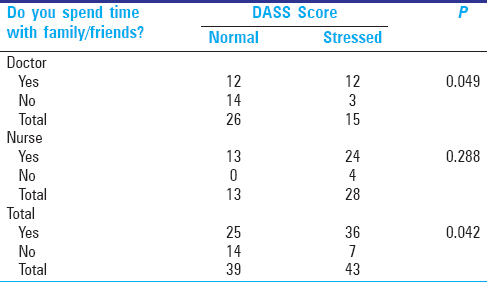 The DASS  is a 42-item self-report instrument designed to measure the three related negative emotional states of depression, anxiety, and stress. It has 14 items each on stress, anxiety, and depression. Each item has to be rated by a four-point rating scale. The rating scale is as follows: 0 (did not apply to me at all), 1 (applied to me to some degree, or some of the time), 2 (applied to me to a considerable degree, or a good part of time), and 3 (applied to me very much, or most of the time). In the present study, only stress assessment will be carried out, and hence, only 14 questions related to stress will be administered to participants. The final scoring is done by adding 14 items of stress and categorized as normal, mild, moderate, severe, and extremely severe. For stress score, 0–14 is normal, 15–18 is mild stress, 19–25 moderate, 26–33 severe, and >34 is very severe stress. The data collected was entered into Ms Excel. Data analysis was performed by using SPSS (Statistical Package for Social Sciences) Version 19.0 developed by IBM Corporation. Qualitative data was expressed by using frequency and percentage. Quantitative data was explained by using descriptive statistics, viz. mean/median/SD/range. To compare the level of stress with various parameters, we used Chi-square test/Fisher's exact test. P value of 0.05 was considered as significant. The overall prevalence of stress among ICU staff (doctors and nurses) was 52.43%. Prevalence of stress among ICU doctors was 36.58% and nurses was 68.29%. As per DASS (stress component only), 19.51% doctors were mildly stressed, 14.63% were moderately stressed, and 2.44% were severely stressed. Among nurses, 48.78% were mildly stressed and 19.51% were moderately stressed [Table 1]. Of the 82 study participants (ICU doctors and nurses), 36 were males and 46 were females. Age ranged between 23 and 42 years. Average age was 28 years. Of them, 25 (30.48%) belonged to ≤ 25, 37 (45.12%) belonged to 26–30, 12 (14.63%) belonged to 31–35, and 8 (9.75%) belonged to 36–42 years. Forty were married and 42 were unmarried. Forty one were doctors and 41 were nurses [Table 2]. [Table 3] depicts that when question was asked about Spended time with family/friends for doctors and nurses, association of stress was found among the doctors and not in the nurses. When ICU staff were asked about any stressful event at workplace/home, it was found that majority of them had passed through some sort of stress either at workplace or at home. A significant association was found for total ICU staff. If separately, no association was found for doctors [Table 4]. To correlate stress with some of the other variables, questions such as change in temperament after started working in ICU were asked. A statistically significant association was found. This indicates that stress was responsible for change in temperament among them [Table 5]. When ICU staff were asked that whether they face problem in sleep pattern after started working in ICU, a significant association was found for total ICU staff. Separate association for doctors and nurses was not noticed [Table 6]. The ICU is a highly stressful environment, not only for patients and relatives but also the ICU staff (doctors and nurses). The primary aim of this study was to assess the prevalence of stress and its level among ICU staff and to correlate certain variables. There were very few studies available to determine the prevalence of stress in ICU doctors and nurses. No such studies were available from India. The overall prevalence rate of stress among ICU staff was found to be 52.43% in the present study. Coomber et al. (2002) in their study among ICU doctors in UK reported 29% prevalence of stress. One of the reason for the high prevalence of stress in our study might be the difference in the tools used to assess the stress. Moreover, our study was questionnaire based, and the result depended on voluntary provision of correct information by the study participants. In our study, it was seen that ICU staff less than 35 years of age had a high prevalence of stress compared to staff above 35 years of age. This can be explained by the view that younger staff have a new level of responsibility and increased workload (being the younger staff of the ICU) in addition to patient care activities, whereas older ICU staff are more experienced and might have well-adjusted to the stressful environment. This result is in agreement with findings of Elkahlout et al. (2003), which showed significant negative relationship, indicating younger staff presented high level of stress. There were no significant differences in the stress score of gender groups between males and females which is consistent with the work of Elkahlout et al.(2003). In addition, there were no significant differences in the stress of marital groups (although it was not statistically significant), which is inconsistent with the work of Callaghan et al. (2000), finding who reported that singles had marginally higher stress scores than married. However, our result is consistent with the findings of other study (2008) those not found that marital status to be relevant as a stress source. ICU staff who were not spending time with family and or friends were more likely to be in stress than ICU staff who were spending more time to the family and friends. Earle et al. (2005) found similar result in their study. This finding can be explained by the fact that family and friends are the topmost supports in one's life and provide the social and mental security to a person. The family is also like a shock absorber to the stress and strain of life. Stress was found to be significantly more in ICU staff who had some stressful event either at workplace or at home. 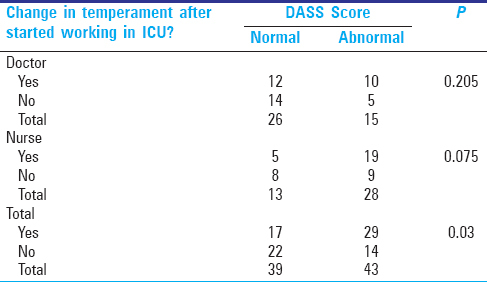 These data were statistically significant when accounted for ICU staff in common. This can be explained by the fact that any recent stressful event either at workplace or at home may lead to more stress and can hamper day to day activities. A statistically significant association was found with stress when question was asked with ICU staff that whether they experience change in temperament after started working in ICU, this may be due to the reason that ICU is a highly stressful environment where decision about end-of-life care are made. 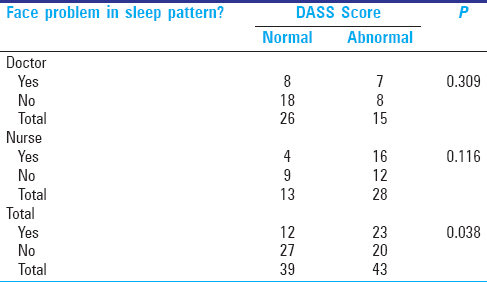 Significant correlations between problems in sleep pattern and stress was found in ICU staff. This may be due to the shift rotation which is considered most stressful. This result is the finding of Lewwis DJ (1992) & Franco AC(1994) who found shift rotation as the most stressful shift. Understanding occupational stress in ICU Staff in India is still a new concept. While it is important to educate doctors and nurses regarding stress management, it is just as important to have tangible change within the hospital environment too. Practical recommendations for the hospital are as follows: Organizational change and stress management targeting the ICU staff (like in-between periodic training). Because it was a questionnaire-based study, the response made by the ICU staff may not be true information. Further, stress scale used was a subjective criteria because no objective criteria is available for stress measurement. Available from: http://www.who.int.searo.org [home page] access on 3/11/15. Mental Health and Substance Abuse; Conquering Depression. Available from: http//www.searo.who.int/en/Section1174/Section1199/Section1567/Section1826_8097 [Last accessed on 2015 Nov 03]. Grunfeld E, Whelm TZ, Zitzelsberger L, Willioam AK, Manteants B, Evans WK. Cancer care workers in Ontario: Prevalence of burnout job stress and job satisfaction. Can Med Assoc J 2002;163:166-9. Gundersen L. Physician burnout. Ann Intern Med 2001;135:145-8. Demir F, Pinar AY, Erbas M, Ozdil M, Yasar E. The Prevalence of depression and its associated factors among resident doctors working in a training hospital in Istanbul. Turk J Psychiatry 2007;18:31-7. Coomber S, Todd C, Park G, Baxter P, Firth-Cozens J, Shore S. Stress in UK intensive care unit doctors. Br J Anesth 2002;89:873-81. NSN Rao, NS Murthy. Applied Statistics in Health Sciences. 2nd ed. Delhi: Jaypee; 2010. Available from: http://www2.psy.unsw.edu.au/dass/. [Last accessed on 2015 Nov 03]. Elkahlout GR, Ahmad OA. The effect of some socio-demographic factors on job stress level in nursing work. Umm Alqura Univ J 2003;15:31-53. Callaghan P, Tak-Ying SA, Wyatt PA. Factors related to stress and coping among Chinese nurses in Hong Kong. J Adv Nurs 2000;32:1518-27. Cavalheiro AM1, Moura Junior DF, Lopes AC. Stress in nurses working in intensive care units. Rev Lat Am Enfermagem 2008;16:29-35. Earle L, Kelly L. Coping strategies, depression, and anxiety among Ontario family medicine residents. Can Fam Physician 2005;51:242-3. Park K. Textbook of Community Medicine. 22nd ed. Jabalpur: Banarsidas Bhanot; 2013. p. 636. Lewwis DJ, Robinson JA. ICU nurses coping measures: Response to work-related Stressors. Crit Care Nurs 1992;12:18-25. Franco AC. Striving to care: A qualitative study of stress in nursing. Department of Educational Psychology and Counseling. Montreal, Canada: Thesis, Faculty of Education, McGill University; 1994.